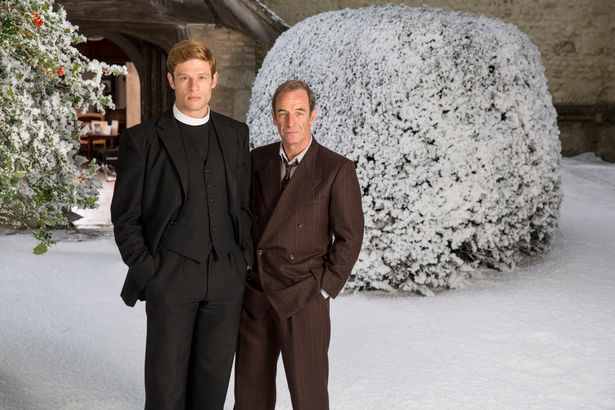 It’s well established that Grantchester’s rural Cambridge setting can’t contain the capering of vicar-detective Sydney Chambers (played by James Norton) and his pal Geordie Keating (Robson Green) – seeing them often in the Big Smoke. So of course, for the festive special, London serves up some Christmas cracker locations. The special is on Christmas Eve at 9pm on ITV, kicking off the new six-part series. Bromley’s Old Town Hall, Haringey’s old Hornsey Town Hall and Southwark’s Peckham Liberal Club get us in the 1950s mood. In Haringey, there’s drinking and dancing in Hornsey Town Hall and interior filming in a home on Mount View Road. More ballroom dancing – and drinking at the bar – in Southwark’s Peckham Liberal Club. But it all gets a bit darker in Bromley’s Old Town Hall, where the basement was used for scenes including a morgue, locker room, lineup room, and a corridor to pace along.